Late season bloomer - worth waiting for! 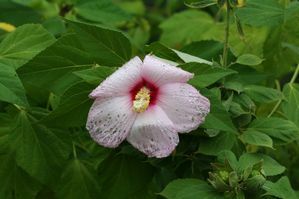 Hibiscus moscheutos, Swamp rose-mallow, is a fast growing cold-hardy plant. Striking when grown in colonies in average to moist soil in wetlands, on pond edges and along streambanks. Growing 4-6' tall in full sun, Swamp rose-mallow is very useful in projects when moisture levels are too high for traditional perennials. The monstrous pink flower with dark pink center, sometimes measuring up 10-12" wide, will provide great color from August through September. The stems and spent seed pods of Swamp rose-mallow persist through winter and will add vertical interest during those dark cold days of the winter. • Low Marsh 0 - 6"